Hover over the main photo to magnify or click to enlarge. Vintage Avon necklace & earrings, faceted faux citrine & rhinestones on gold plated gilt metal, 1970`s ca, American. 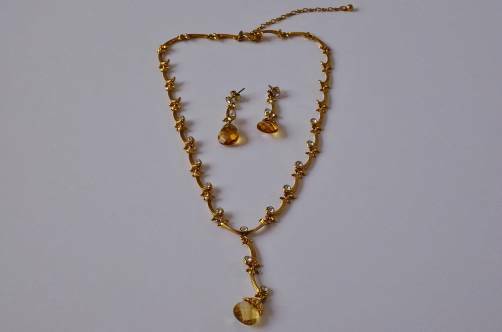 This necklace & earrings have been gently cleaned. They are in excellent condition with no chips to the stones all of which are original. The set comes in the gift box as photographed. 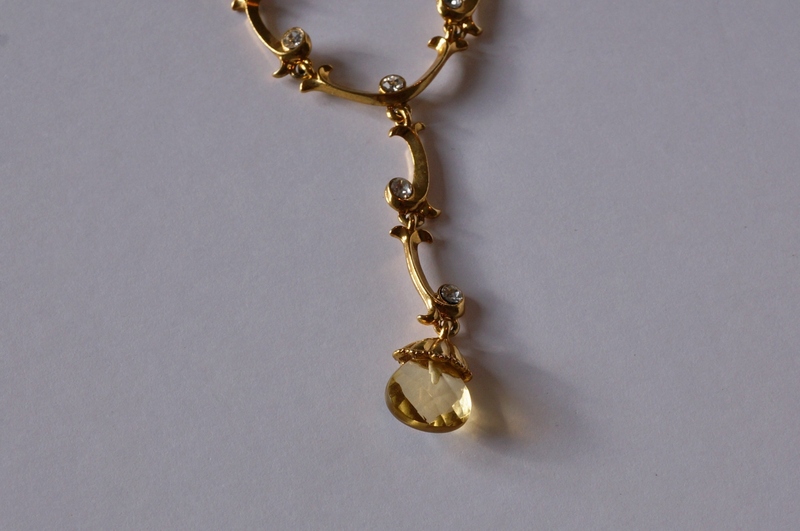 From the centre of this necklace hangs a regal faux citrine faceted by hand. 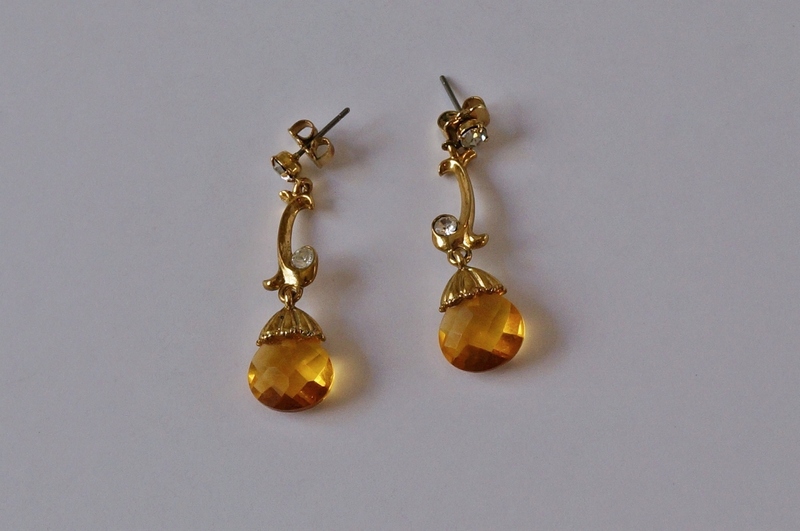 The earrings have a similar but slightly smaller citrine drop. 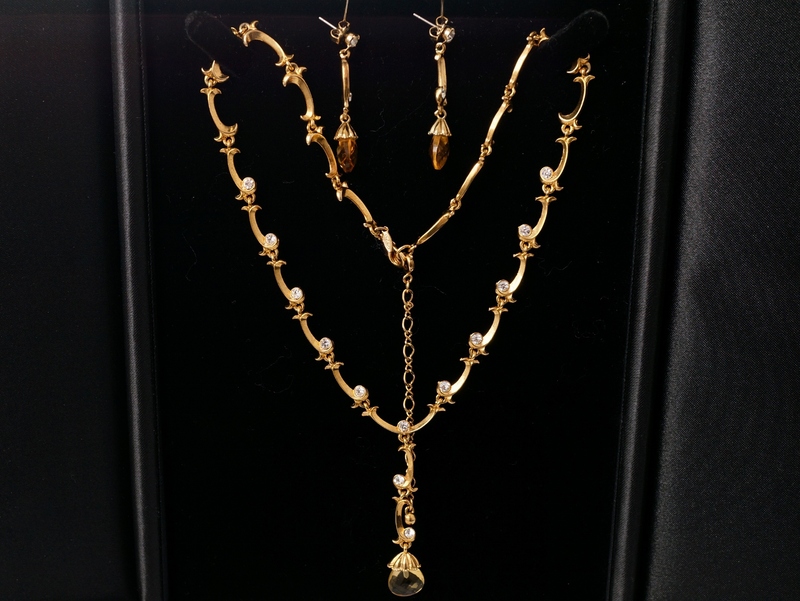 The light-yellow colour of the stone is subtle and fitting for the baroque foliate swag of the gilt metal chain. 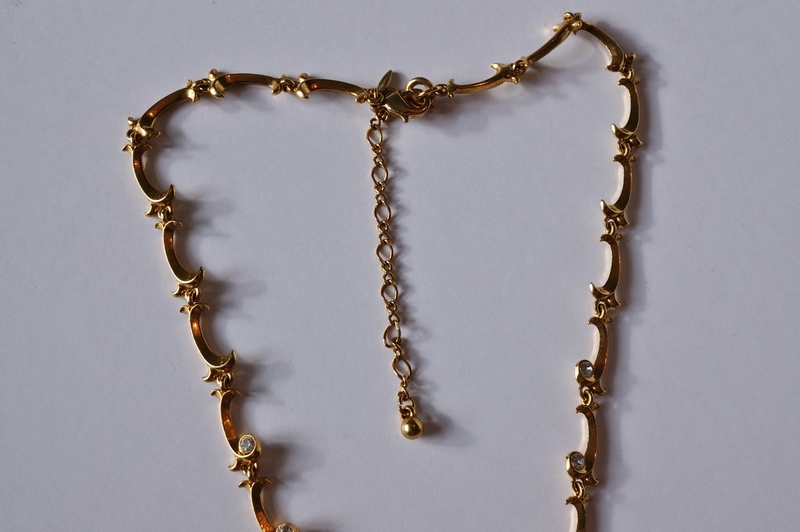 The scalloped pattern of the chain is punctuated with rhinestones. The result is feminine & princess-like. 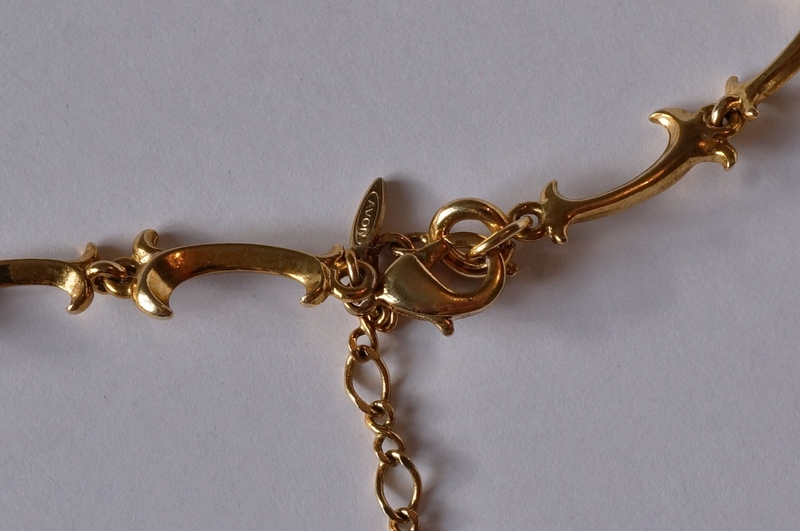 The necklace has a closing clasp and there is 4 cm of chain to vary the length. 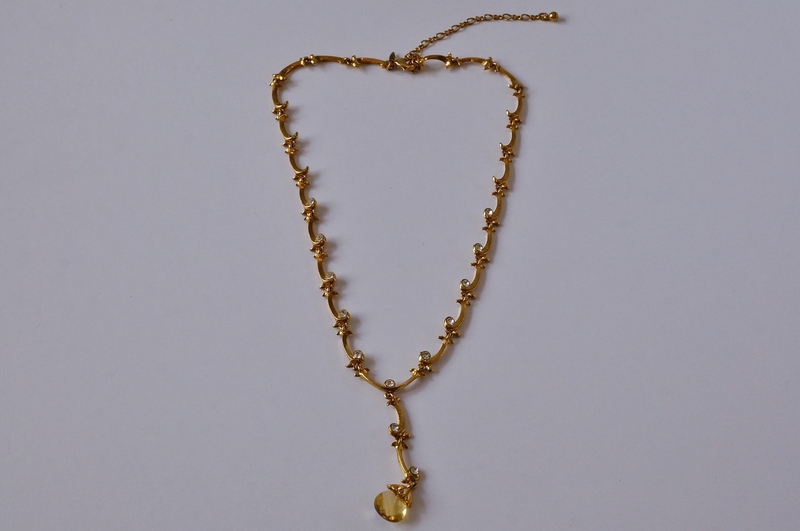 The chain has a tag stamped Avon and at the end of the chain there is a gold-plated ball to weight it down. 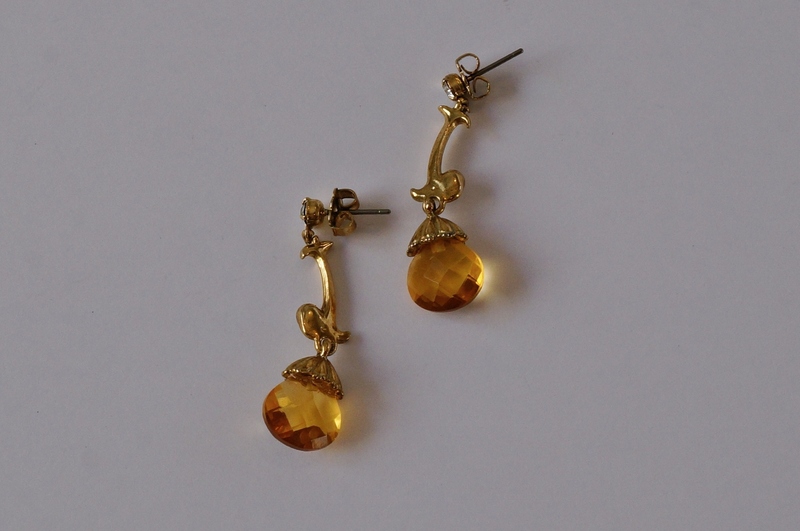 The earrings are for pierced ears with secure studs and the original gold toned backs. Avon was founded in 1886 by David H. McConnell when the New York door-to-door salesman shifted from books to perfumes. In 1892, McConnell changed the company name when his business partner, who was living in California, suggested that he call the business the California Perfume Company, because of the great abundance of flowers in California. In the 1920`s jewellery was added and by 1939 the company was operating as `Avon Products Inc`. 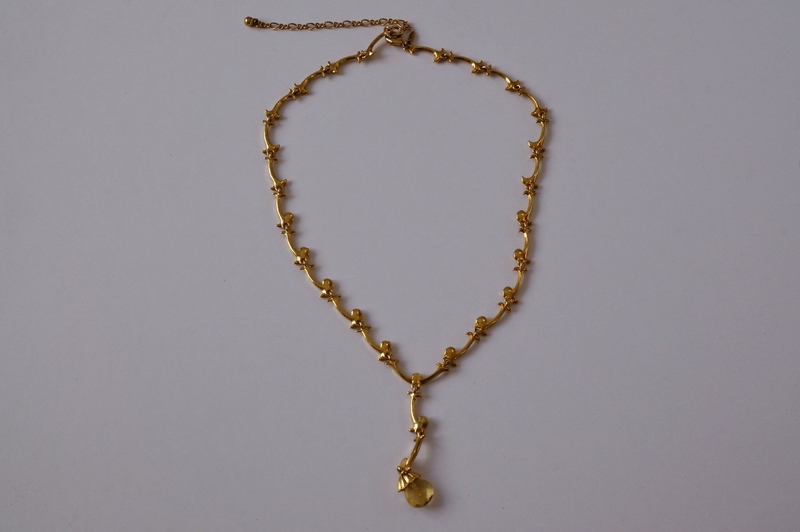 By the late 70`s Avon was the World`s largest seller of costume jewellery and has since taken over many costume jewellery companies in America such as: Sara Coventry, Trifari, Coro. In the 1980`s the company owned the fine jewellery company Tiffany`s. Famous designers for Avon include Kenneth J Lane, Elizabeth Taylor, Joan Rivers.